This is a popular Lebanese snack/street food. Garlic sauce with Tahini ... You get it ready in stores. 1. Warm the pita breads on a griddle/tawa and cut them into two. 2. Open up like pockets and spread the garlic sauce or diluted hummus. 3. Line with Lettuce or parsley. Stuff with falafels, sliced onions and tomatoes. Spoon out a little hummus on top. Serve immediately before they become soggy. Unique and delicious one !! very delicious ones, pita pockets sounds great !! fantastic!! 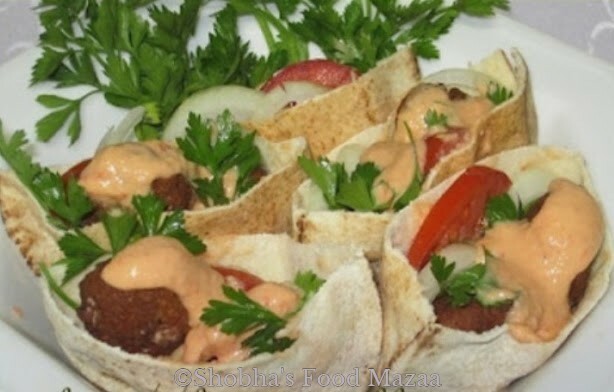 pita pockets with falafel and hummus looks delicious... Thanks for linking it to my event.. This looks so delicious. Thanks for linking this and also thanks for removing the captchas.